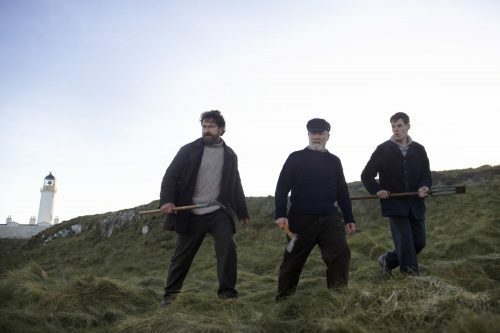 The first look image from the psychological thriller shows Gerard Butler (London Has Fallen, How to Train Your Dragon, Coriolanus, 300), fellow Scot Peter Mullan (Tyrannosaur, War Horse, Trainspotting) and newcomer Connor Swindells on location at the Mull of Galloway for KEEPERS, which is inspired by a true, unsolved local legend- the Flannan Isle mystery. On an uninhabited island 20 miles from the rugged Scottish coast, three lighthouse keepers arrive for their six week shift. As Thomas (Mullan), James (Butler) and Donald (Swindells) settle into their usual, solitary routines, something unexpected and potentially life-changing occurs- they stumble upon something that isn’t theirs to keep. Where did it come from? Who does it belong to? A boat appears in the distance that might hold the answer to these questions… What follows is a tense battle for survival as personal greed replaces loyalty – and fed by isolation and paranoia, three honest men are led down a path to destruction.